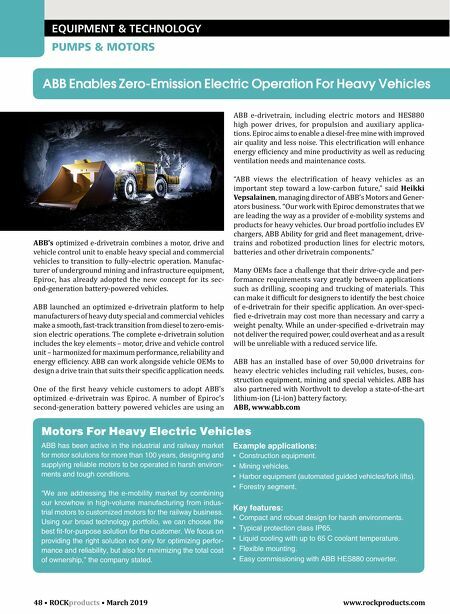 48 • ROCK products • March 2019 www.rockproducts.com EQUIPMENT & TECHNOLOGY PUMPS & MOTORS ABB Enables Zero-Emission Electric Operation For Heavy Vehicles ABB's optimized e-drivetrain combines a motor, drive and vehicle control unit to enable heavy special and commercial vehicles to transition to fully-electric operation. Manufac- turer of underground mining and infrastructure equipment, Epiroc, has already adopted the new concept for its sec- ond-generation battery-powered vehicles. ABB launched an optimized e-drivetrain platform to help manufacturers of heavy duty special and commercial vehicles make a smooth, fast-track transition from diesel to zero-emis- sion electric operations. The complete e-drivetrain solution includes the key elements – motor, drive and vehicle control unit – harmonized for maximum performance, reliability and energy efficiency. ABB can work alongside vehicle OEMs to design a drive train that suits their specific application needs. One of the first heavy vehicle customers to adopt ABB's optimized e-drivetrain was Epiroc. A number of Epiroc's second-generation battery powered vehicles are using an ABB e-drivetrain, including electric motors and HES880 high power drives, for propulsion and auxiliary applica- tions. Epiroc aims to enable a diesel-free mine with improved air quality and less noise. This electrification will enhance energy efficiency and mine productivity as well as reducing ventilation needs and maintenance costs. "ABB views the electrification of heavy vehicles as an important step toward a low-carbon future," said Heikki Vepsalainen, managing director of ABB's Motors and Gener- ators business. "Our work with Epiroc demonstrates that we are leading the way as a provider of e-mobility systems and products for heavy vehicles. Our broad portfolio includes EV chargers, ABB Ability for grid and fleet management, drive- trains and robotized production lines for electric motors, batteries and other drivetrain components." Many OEMs face a challenge that their drive-cycle and per- formance requirements vary greatly between applications such as drilling, scooping and trucking of materials. This can make it difficult for designers to identify the best choice of e-drivetrain for their specific application. An over-speci- fied e-drivetrain may cost more than necessary and carry a weight penalty. While an under-specified e-drivetrain may not deliver the required power, could overheat and as a result will be unreliable with a reduced service life. ABB has an installed base of over 50,000 drivetrains for heavy electric vehicles including rail vehicles, buses, con- struction equipment, mining and special vehicles. ABB has also partnered with Northvolt to develop a state-of-the-art lithium-ion (Li-ion) battery factory. ABB, www.abb.com Motors For Heavy Electric Vehicles ABB has been active in the industrial and railway market for motor solutions for more than 100 years, designing and supplying reliable motors to be operated in harsh environ- ments and tough conditions. "We are addressing the e-mobility market by combining our knowhow in high-volume manufacturing from indus- trial motors to customized motors for the railway business. Using our broad technology portfolio, we can choose the best fit-for-purpose solution for the customer. We focus on providing the right solution not only for optimizing perfor- mance and reliability, but also for minimizing the total cost of ownership," the company stated. Example applications: • Construction equipment. 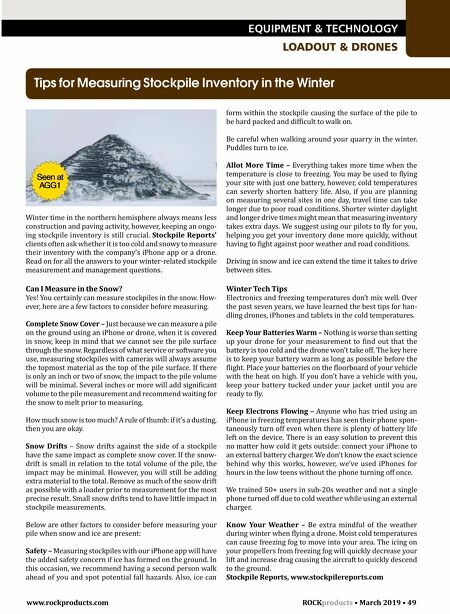 • Mining vehicles. • Harbor equipment (automated guided vehicles/fork lifts). • Forestry segment. Key features: • Compact and robust design for harsh environments. • Typical protection class IP65. • Liquid cooling with up to 65 C coolant temperature. • Flexible mounting. • Easy commissioning with ABB HES880 converter.